The Progressive Dynamics Inteli-Power 9100 Electronic Power Converter series have numerous features that set them apart from a competitive electronic RV power converter. Data collected over the course of eight years on more than 400,000 of these units have proven that their design features increase reliability and provide many additional benefits. One of the several features is built-in electronic current limiting. This safety feature will quickly reduce the output to zero volts in the instance of an electrical short or overload condition. This acts as a "circuit breaker" in order to prevent potential wiring and converter damage in your RV. Should the converter be connected to the RV battery incorrectly, the unit will not need replacing like most competitors. Just simply swap the converter fuse and the converter will return to normal operation. Inteli-Power 9100 Electronic RV Power Converter series feature protection against abnormal voltages. Whether the voltages are too high or too low, an Inteli-Power Converter will prevent damage that would otherwise occur. These converters can operate on lower voltages without damage. This is extremely important given that some RV campgrounds have voltages as low as 90 volts, possibly damaging the typical competitive RV converter. Should the voltage supply end up too high, the Inteli-Power 9100 series of converters will shutdown to prevents damage to sensitive electronics, using patented High Voltage Shutdown circuitry. 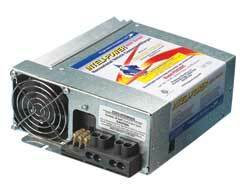 Typical converters can rise to hot temperatures, but Inteli-Power has you protected! The 9100 series of power converters implements a Variable Speed Intelligent Cooling Fan system to control that unwanted heat supply. This system automatically monitors the converter temperature and will activate the cooling fan at the appropriate speed required to keep it cool. The fan operates at slow and quiet speeds while the demand is low, such as during sleeping hours, to create a peaceful environment when needed most, thus avoiding unnecessary usage of the converter. Should the power converter become too hot or experience the unlikely event of a fan failure, the converter will automatically shutdown to prevent damage. Another great brand of RV Converter Charger products is Parallax. They dedicate themselves to creating Solid State, Switch-Mode converter products and include "deck mount" models. Their products provide safe, clean power output without spikes and surges. All of their products are convered by a limited warranty. Some of their converters include: 7430 30 Amp Converter/Charger, 7465 65 Amp Converter/Charger, and the 7345 45 Amp Electronic Conerter/Charger. 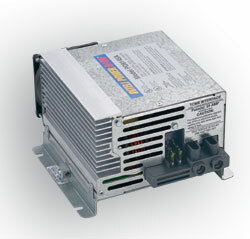 This RV converter provides a reliable, filtered DC power supply to all RV 12-volt lighting and appliance circuits. 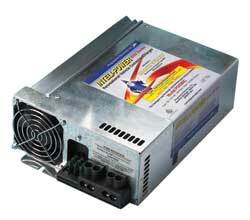 This converter also supplies quick and safe recharging of RV batteries. The built-in TCMS (Total Charge Management System) connector allows the RV owner to add the Charge Wizard with ease. The Charge Wizard is a microprocessor-controlled system that monitors the usage and battery voltage to ensure a fast, yet safe recharge. The Charge Wizard automatically chooses one of three charging voltages and one of four operating modes depending on the condition and use of the battery. 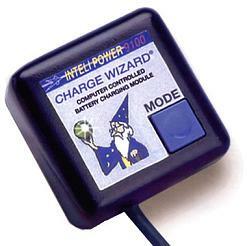 The Charge Wizards is sold seperately from the 9100 series of converters. Dimensions: 3.6" x 11.5" x 9"
Dimensions: 3.6" x 8" x 9"
This RV power converter is manufactured to provide reliable filtered DC power to an RV. 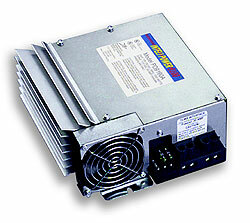 This converter also provides the same standard features of any other converter in the 9100 series. Made for less demand, this converter still has built-in features such as electronic current limiting, reverse battery protection, high voltage protection, low voltage operation, and over temperature shut down to ensure long term reliability for your RV. 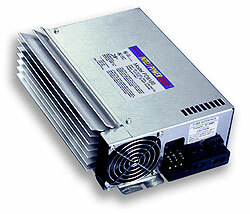 Dimensions: 4.5" x 8.25" x 7.25"
The 9260 power converter is a continuation of the 9100 series. It has all of the same features of the 9100 convertes and more. The built-in Accessory Port makes it easy to add the Converter Status Remote Pendant that shows the charger/converter status. It also features the Charge Wizards as a built-in item! Purchasing a 9100 Series Converter? Don't Forget a Charge Wizard! The Charge Wizard is a microprocessor-controlled device created to operate solely with the 9100 Series Inteli-Power Converters. It monitors the RV battery constantly, then changes the converter output voltage depending on its charge status. The Charge Wizard has four operating Modes (BOOST, NORMAL, STORAGE AND EQUALIZE). Each of these operating modes promises a fast, safe recharge for your RV battery. These functions may be automatic, but you can switch them manually by pressing and holding the Mode Select Button down. When the button is first pressed, its indicator light will be on constantly, showing that it is in 'boost' Mode (14.4 VDC output). If the button is held down, the Charge Wizard will switch into normal mode with the light blinking about once a second (13.6 VDC output). Keep holding the button down to switch into storage mode (13.2 VDC output) which will cause the light to blink just once every five seconds. Any time you switch the mode out of normal operation, it will automatically switch back after 4 hours. Every 21 hours of storage mode operation, the Charge Wizard switched into equalize mode. This is the same as boost mode, except that it lasts just 15 minutes. This helps to mix up battery electrolytes and prevent stratification from damaging your battery. Copyright © 2009 RV Converter.NET All rights reserved.